The beauty of this trifle is that I actually only cooked one piece of the trifle puzzle, which is the vanilla custard. The rest, I just assembled. And I’ll make no apologies for that. Let someone else do some of the cooking while I catch up on work sit and sip a glass of brandy. 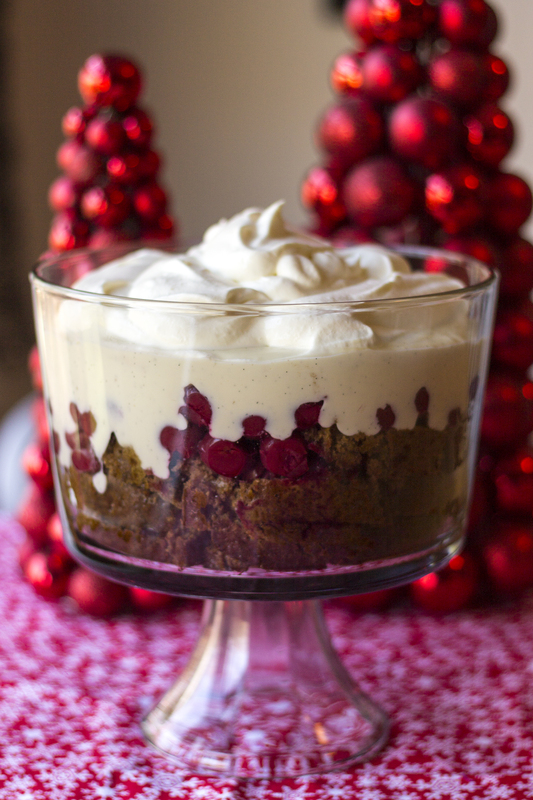 If you don’t have a trifle bowl, no worries. Just use a pretty glass bowl instead. It’s not about perfection; it’s about delicious. And if you can’t find a loaf of gingerbread, you can make your own or buy a gingerbread mix at the grocery store. Happy holidays to you and yours. Cut the gingerbread loaf into slices. Spread some cherry jam on one side and sandwich together with another slice of gingerbread. Once you have all of your gingerbread sandwiches, place in the bottom of your bowl. Cover the bottom. It will layer up and doesn’t have to be pretty. Pour your ginger liqueur over the gingerbread. 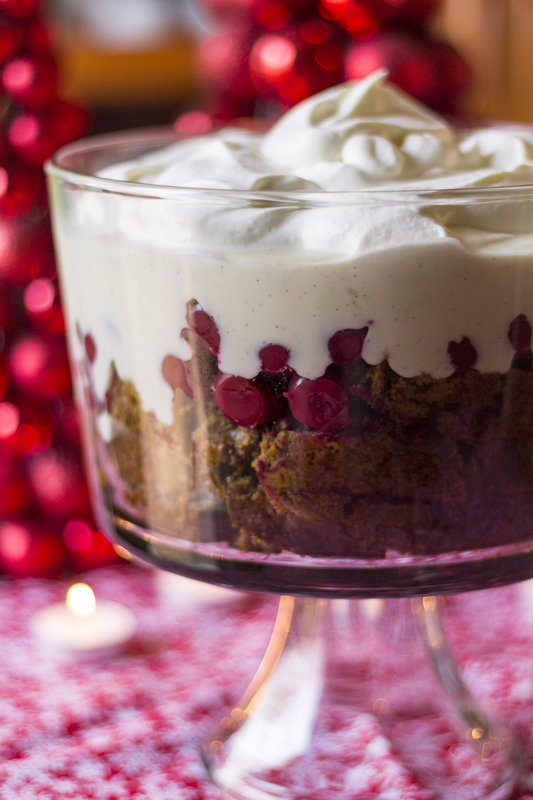 Place your cherries on top of the gingerbread, and make sure that some are against the edge of the bowl, so you will see them once the trifle is assembled. Cover with plastic wrap and set aside while you make the custard. This step can be done a day or two in advance. Once the vanilla custard is cooked and cooled, add to the top of the cherries and spread evenly. Cover and refrigerate overnight or at least several hours. Before serving, whip up some cream by combining the heavy whipping cream with the confectioner’s sugar and vanilla extract. It will only be slightly sweet, but that’s okay; you want to balance the sweetness of the dessert. Beat until soft peaks form, and top your custard. You wouldn’t be wrong to add some candied ginger to the top of your trifle too. Bask in the glory of your awesomeness. In a medium bowl, combine the egg yolks with 1/4 cup of the milk. Set aside. In a saucepan, whisk together the sugar, corn starch, and salt. Slowly add the remaining milk and cream, while whisking. Add the vanilla bean seeds. (If you are using vanilla extract, wait to add until after the custard is done cooking.) Heat over medium heat until the mixture comes to a light simmer, while stirring often. Slowly ladle the warm milk mixture into the egg yolks, quickly whisking while you combine. Add the custard back to the saucepan and cook over medium-low heat until the custard thickens, about 3-5 minutes. Remove from the heat, and stir in the butter (and vanilla extract, if using). Pour into a bowl and place a piece of plastic wrap directly on the pudding so it doesn’t form a skin. Allow to cool and then place in refrigerator for at least 2 hours. This looks unbelievably wonderful! This needs to be made this weekend! Oh, it is. When Taylor tried some he told me it made his shoulders relax. I think he moaned a bit too. I guess because I thought that trifle should always be in a big glass bowl is why I never attempted making one, but an idea just dawned on me…beer goblets. I was sold as soon as I saw the vanilla bean-speckled custard! 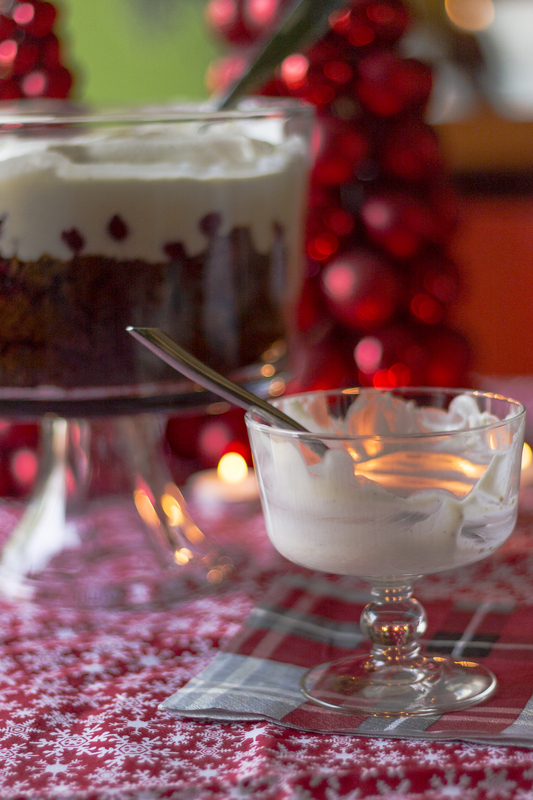 Besides beer, I can think of no other thing better to go in a beer goblet than trifle. Brilliant idea!